You have seen it before. The spoofs of Hollywood alien attack movies, absorbed into an animation superhero flick. Unlikely social misfits, draw inspiration and save the world, while passing off funny one-liners. 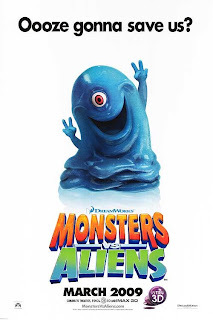 Monsters Vs Aliens is an entertaining film in comfortable, tested territory, only that it doesn't try doing anything else.